J-Pop lovers, your time has come! 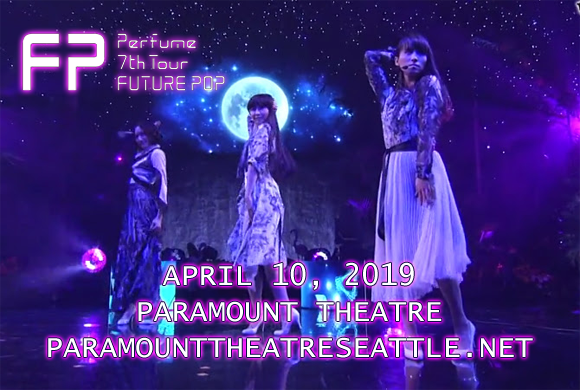 Japanese pop trio Perfume are headed to Paramount Theatre Seattle on Wednesday 10th April 2019 on their Future Pop tour! A feast for all the senses, Perfume's live shows feature high-octane synchronized choreography and incredible visual backdrops, effects and projects to create a unique and immersive experience! Don't miss your chance to see this innovative, energetic trio live! Japanese pop girl group Perfume formed in early 2000 when its members, Ayano Ōmoto("Nocchi"), Yuka Kashino ("Kashiyuka") and Ayaka Nishiwaki ("A~chan") studied together at the young talent academy Actors School Hiroshima, in Hiroshima Prefecture, Japan. The trio signed to management agency Amuse, Inc. in 2003, and in 2005 they made their major label debut with the single "Linear Motor Girl" on the label Tokuma Japan Communications. The group's breakthrough came in 2008 when their seventh single, "Polyrhythm", was chosen to be the theme song of a recycle campaign by NHK. The song became their first Top 10 single, peaking at number seven. Subsequently, every Perfume single has charted in the Top Five of the Japanese charts. Their sixth studio album, Future Pop, was released in August 2018 and became their seventh number-one album in Japan.